We have an Exclusive Offering of etched copper and sterling silver earrings with the herder in mind. Check out these One-of-a-Kind hand-crafted earrings only from Operation Sheepdog Herding! The copper has been completely sealed to preserve patina and prevent skin from turning green. Sterling is sealed to preserve the patina. 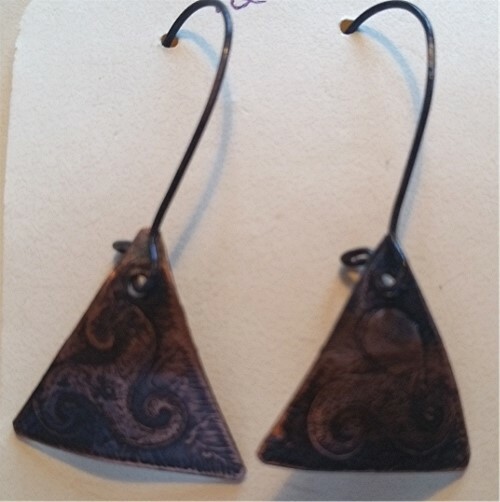 Dress up for that important trial with these etched herding earrings. We have copper earwires on copper earrings, if a different metal earwire is desired, just note on menu under earwire metal. We cannot wear copper in our ears, so have to go to sterling. We also offer Celtic inspired earrings adorned with semi-precious stones.